My mom bought my dad some Greek and Indian cooking lessons for his birthday one year. (He's one of those rare men that enjoys cooking and does it well.) So now we look forward to his Greek dinners with anticipation. But he lives on the other side of the country from me so I finally caved and decided to learn how to make some things myself. 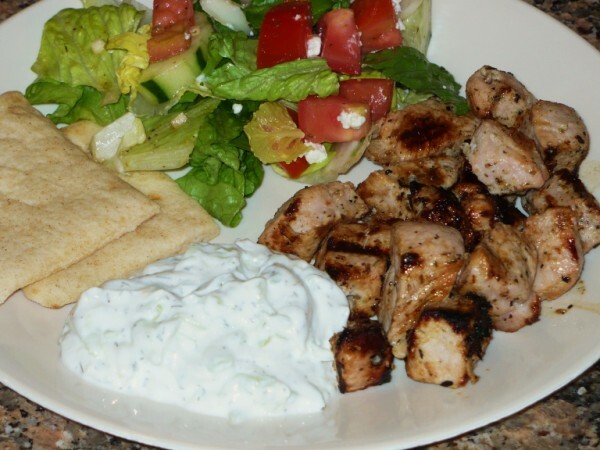 If you frequent Greek restaurants or gyro shops, you are probably familiar with souvlaki and tzatziki. Souvlaki is traditionally made with lamb or pork but can also be make with chicken and is essentially a marinated and grilled meat. 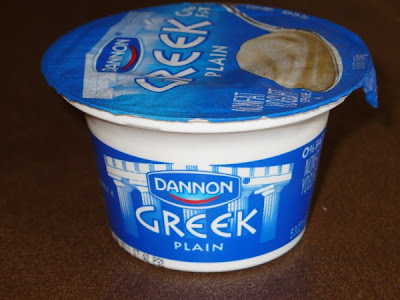 You can serve it in a pita with lettuce and tomato gyro-style or on it's own. It's best served with the complimentary tzatziki which is essentially a yogurt and cucumber mixture that is either flavored with dill or mint. I like dill best. Tzatziki is also a great dip for pita crisps or vegetables. These 5.3 oz containers run about $1 a piece at Walmart and you'll need about 3 1/2 to make this recipe. Or maybe you'll get lucky and find a bigger container at your grocery store. The shredded cucumbers give it some crunch, but if you want your tzatziki sauce more smooth, pulse it in a food processor or blender. Combine all ingredients in a gallon size Ziploc bag and marinate 3-4 hours or overnight. If grilling: Soak wooden skewers in water for 1 hour. Preheat grill to med-high heat. Thread cubes onto skewers and grill for 10-12 minutes for pork or 8-10 minutes for chicken, turning occasionally. If sauteing: Heat large skillet over med-high heat. Saute in 2-3 batches (to ensure even cooking) for 8-10 minutes for pork or 6-8 minutes for chicken. Place shredded cucumber in a strainer and squeeze out excess water with your hands. In a medium bowl, combine yogurt, cucumbers, lemon juice, garlic, salt, and dill. Cover and chill for at least 2 hours to let flavors mingle. *Some people prefer mint over dill in their tzatziki. You can substitute 1 Tbsp. chopped fresh mint for the dill.